Location: Offshore on wreckage, and rock piles. Inshore on turtle grass flats, sand flats, and outlining channel. Atlantic Ocean, Gulf of Mexico and every coastal country. More common in South Florida and the Florida Keys. Observation: Seen floating above wrecks or in deepwater. Traveling the flats in search of food. Often seen with it tail out of the water with the head pushing through the sand in efforts to scavenge crab. 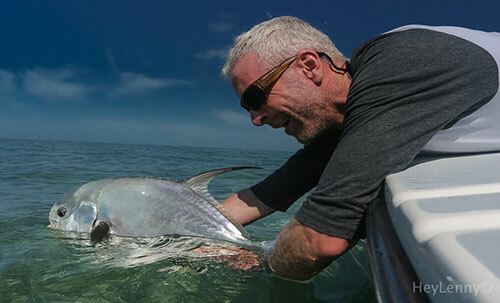 The dream sport fish of flats fishing enthusiast are found in abundance in the water off Key West, Florida. These allusive fish will tempt you toward your fate as an angler. A powerful fight once hooked with steady fast runs, and many quick changes of direction. Pound for pound their fight is as good as it get. The flats off Key West are loaded with permit. The geographic location of our flats and the surrounding deep waters provide excellent refuge to the permit. If you want to see a permit, stalk a permit, and catch a Permit let me show you the way. 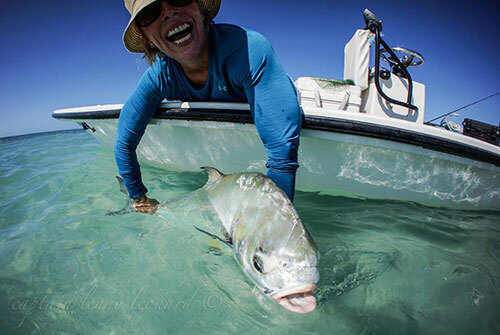 With these fish – as with others on the flats - the more fish you spot, the better your odds at catching one. I’ll put you in range to make it happen as you cast you fiddler crab toward the tailing Permit. We’ll work together as angler and guide to double up on these tenacious fish. Live bait is a great way to capitalize on Key West famous Permit stomping grounds. We do it with light spinning tackle and 6 to 12lb mono. Remember, somebody has to do it. Permit on fly, reaching to another level of fly fishing, like hitting a hole in one in golf or pitching a no hitter in a baseball game. Make it real and make it happen. These fish work you and your guide into a permit fishing frenzy, an intense game of cat and mouse. Working hard to search for food, the permit will not slow down to wait for us, so I will put you ahead of the game and let you make your cast, and tempt your fate. With miles of flats to work, we’ll search from big water to skinny water, tails or muds, doing whatever it takes to get the job done. Work the fly and let the magic unfold. 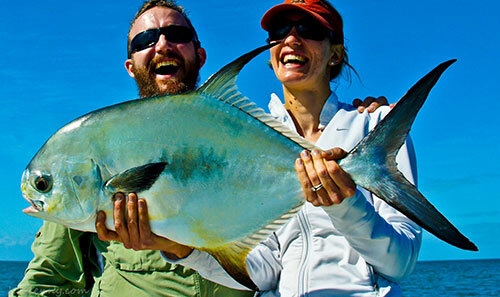 Plenty of permit in Key West to give you a shot at a dream catch on fly. Permit fishing on fly, all good things in all good time. Number 7 to 10 weight fly rod and complimentary reel loaded with plenty of backing. Floating, weight forward taper, line and fluorocarbon leader system. We use the double haul cast - beginners always welcome.